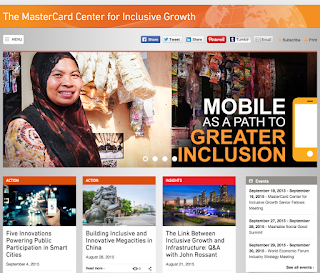 IMTFI Blog: "Any Good Financial Inclusion Policy Must Address Gender"
"Any Good Financial Inclusion Policy Must Address Gender"
Cross-post from MasterCard's new "Inclusion Hub"
"A discussion with Bill Maurer and the team at U.C. Irvine’s Institute for Money, Technology & Financial Inclusion about the challenges and opportunities of pursuing financial inclusion for women. "Women worldwide are disproportionately financially excluded, despite the many economic roles they play in their households and communities. In fact, women are 20 percent less likely to have an account at a formal banking institution than their male counterparts, despite making up more than 40 percent of the world’s workforce. "Inclusion Hub recently sat down with Maurer and his team, Dr. Taylor Nelms (UC Irvine), Dr. Mrinalini Tankha (UC Irvine), Dr. Ursula Dalinghaus (UC Irvine), Dr. Ndunge Kiiti (Houghton College) and Jenny Fan, to discuss some of the obstacles and solutions to expanding women’s access to financial services worldwide."